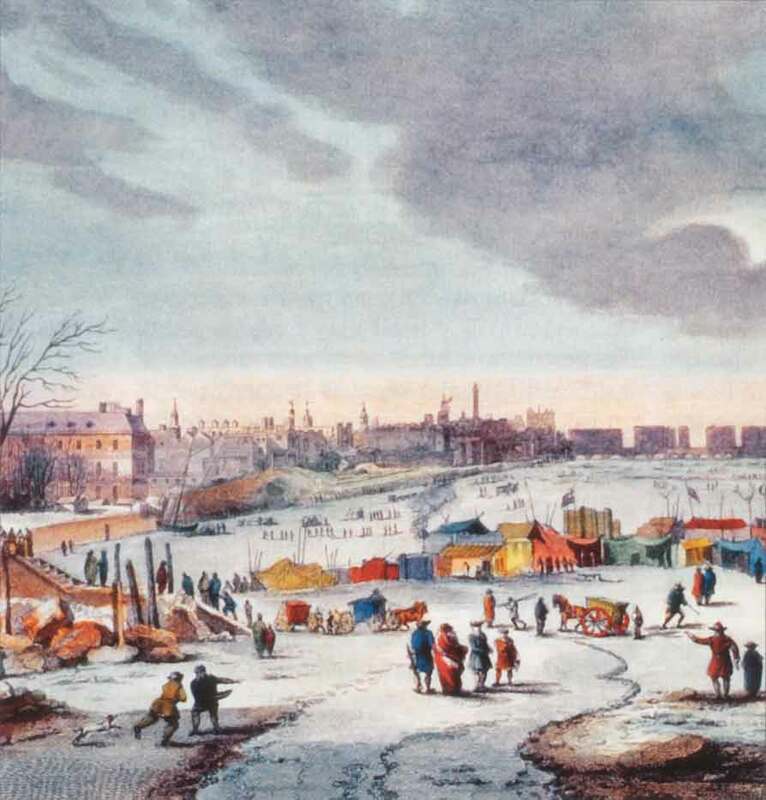 Over a period of 250 years, the River Thames froze so hard that its icy expanse provided the venue for a special festival: the Frost Fair. The reason for the big freeze was a combination of exceptionally hard winters and the unique, medieval construction of London Bridge which slowed the flow of the water. Between 1564 to 1814, at least nine Frost Fairs were held featuring sports, food tents, pubs, coffee-houses, all manner of trades (including a seller of insurance) and even a lottery. 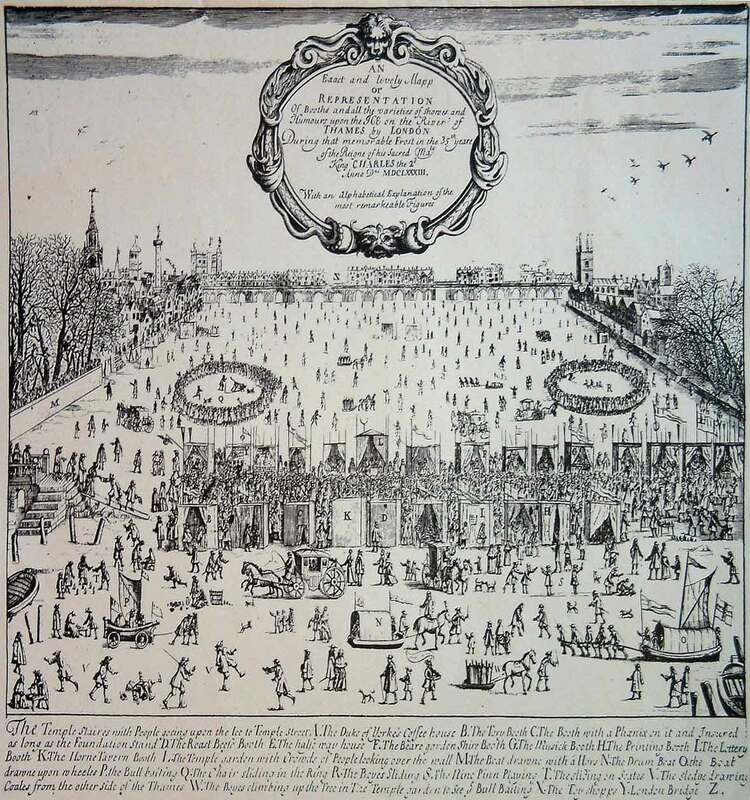 Of all of the Frost Fairs, that of 1684 is one of the best-documented thanks to John Evelyn. A courtier, man of affairs and founder of the Royal Society, Evelyn took a keen interest in the world around him, recording his observations in a diary which opens a fascinating window onto 17th century Britain. Just over a week later, he records that: “I went across the Thames upon the ice (which was now become so incredibly thick, as to bear not only whole streets of booths in which they roasted meat and had divers shops of wares, quite cross as in a town, but coaches and carts and horses passed over)”. Apparently, these commemorative cards became such a craze that printers could make up to five pounds a day ‘for printing a line only at six-pence a name’. Printers also sold ballads, some specially composed in honour of the occasions such as ‘Freezland-Fair or the icey Bear-Garden’. For travellers, the River provided a convenient highway. After dining with the Archbishop one night, Evelyn made his way home by “walking over the ice from Lambeth stairs to Horse Ferry”. During the Frost Fair, various modes of transport were seen on the Thames. Coaches provided transport from Westminster to the Temple while sleds glided along on skates. By the end of January, the Fair had grown to such a size that it ‘was become a camp, ten thousands of people, coaches, carts and all manner of sports continuing and increasing’. However, while the Fair resembled a ‘carnival on the water’, Evelyn notes that it was ‘a severe judgement on the land’ with trees ‘splitting as if lightening-struck, men and cattle perishing in divers places and the very seas so locked up with ice that no vessels could stir out or come in’. Fuel became so expensive that the poor had to rely on charitable donations to stay alive and the fumes from sea-coal became so dense ‘that hardly could one see cross the street, and this filling the lungs with its gross particles exceedingly obstructed the breast, so as one could scarce breathe’. In addition to these difficulties, Evelyn also notes that there was a severe outbreak of small-pox. A keen gardener and horticultural author, Evelyn was dismayed at the toll taken by the severe weather on wildlife and vegetation, noting that birds, fish and exotic plants died and deer parks were destroyed. On a personal level, the greatest loss to Evelyn was the destruction of many items in his garden at Sayes Court. He records that: ‘I found many of the greens and rare plants utterly destroyed; the oranges and myrtles very sick, the rosemary and laurel dead to all appearance’. The one spark of hope was that his cypress tree was ‘likely to endure it out’. The first sign of a thaw came on 4th February when, despite a new freeze, all the booths on the Thames were taken down. More welcome news came a few days later when the sea-ports were once more accessible to ships, Evelyn noting gleefully that: ‘After 8 weeks missing the foreign posts, there came abundance of intelligence from abroad’. After six weeks of extreme weather, the great freeze was over. However, many souvenirs of the Frost Fair remained including ballads, printed cards, pictures and a map cut in copper ‘representing all the manner of the camp and the several actions, sports and pastimes thereon in memory of this signal frost’. Sadly, Frost Fairs are a thing of the past due to warmer winters and the construction of a new bridge in 1831. However, they are not forgotten and visitors to London can see a depiction of the Frost Fair in the pedestrian tunnel under Southwark Bridge on the south side of the Thames. This consists of five large slate slabs engraved by sculptor Richard Kindersley. This impressive artwork includes a rhyme inspired by handbills printed during the Frost Fairs. This entry was posted in 17th century, Diarists, Frost Fair, History, John Evelyn, London, London Bridge, Pepys, River Thames, Royal Society, Sayes Court, Southwark and tagged 1684, 17th century, Diarists, Frost Fairs, History, John Evelyn, London, London Bridge, Royal Society, Samuel Pepys, Southwark. Bookmark the permalink.